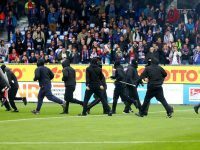 Holstein Kiel hooligans stormed the pitch in an attempt to attack their St. Pauli rivals in 2. Bundesliga match on Tuesday. Varese and Como fans clashed in the stands during an Italian Serie D game on Sunday. Sporting Gijon fans clashed with police outside El Molinon Stadium before yesterday's derby match against Real Oviedo.